Whether you are a lover of beach and water sports or just want to relax by the pool, this is the perfect place for an unforgettable holiday. A beautiful front-line beach apartment with two double bedrooms (one en suite) and a further full bathroom. The second double bedroom also has a single bed. This spacious and airy apartment has a fully fitted kitchen and a large lounge, stylish sofas and dining area. Both the living room and master bedroom have French doors leading on to a private patio, which in turn leads on to lawns and lovely communal gardens. Ideal for a romantic break, or family holiday! The beach is just a few yards away, accessed via a gate in the perimeter security fence.The well known restaurant Perla Blanca is just outside the entrance gates. A communal swimming pool is situated behind the apartment. A beach bar/restaurant is close by, and shops, supermarkets and other restaurants are an easy walk away. Just 6km East of Marbella, it is also an excellent base for golfers and those who want night life in hot spots like Puerto Banus. 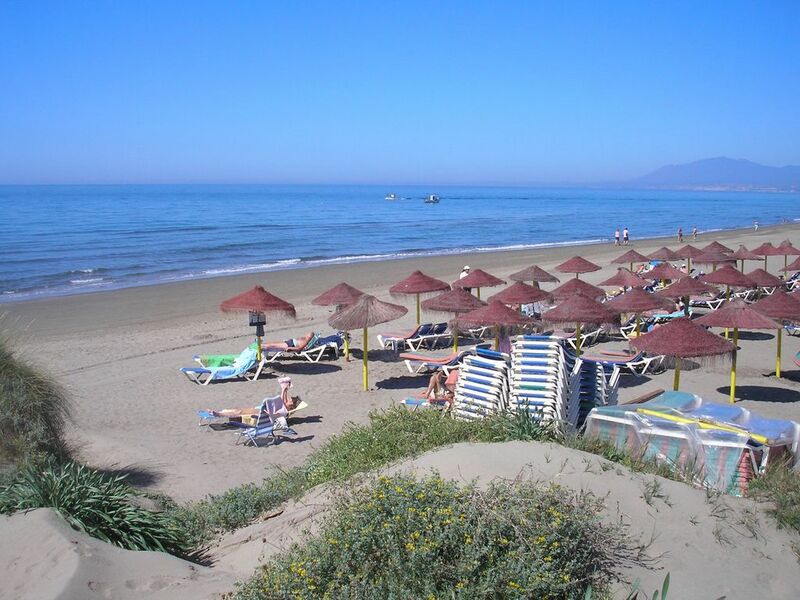 A true beach front luxury apartment: This is a superb quiet beach location, but with easy access to Marbella centre. Within walking distance of shops and restaurants, and only 30 minutes from Malaga airport. The apartment is furnished to high standard with marble floors throughout. There is outside dining furniture on the terrace which opens on to the quiet and private secure gardens. The beach is accessed via a private gate from the gardens. Please e-mail us for more information and photos. Very well located. Fit-out needs improvement. No BBQ when we arrived. No BBQ implements. What arrived was bottom of the range. Kitchen utensils, crockery, glasses sparse. Very nice location at beach. White Pearl Beach - Perla Blanca is hailed as one of the most beautiful beaches on the Costa del Sol and is often much quieter than many others. Good local amenities and facilities are within walking distance, including a couple of clubs/discos, a variety of restaurants and a supermarket. 6Km to the east of Marbella and a little further on the renowned celebrity port of Puerto Banus. Old town Marbella is also definitely worth a visit. It goes without saying that there are hundreds of golf courses in the area, and for those who want to explore further afield, it is just a 20 minute drive to some of Andalucia's picturesque 'white villages' nestled on the hillsides. Above rates are based on up to 4-5 people sharing. Bed linen and towels are provided and beach towels can be provided on request for use outside. Cots and high chairs available at a small extra charge. Special offer next autumn! Many weeks available at only 450€ / week . Please enquire for details. Special offers available on selected dates. Please email for details.